I knew I was in trouble with these cookies when I couldn’t stop eating the dough scraps. one of the many variations of this cookie. The cinnamon, nutmeg, cloves and ginger make these an obvious choice for a holiday cookie (in fact they are a traditional Dutch or Belgian treat served on St. Nicholas’s Eve, December 6th) but it would be a shame if that’s the only time they were made. I love the spices and I love the buttery crunch but I especially love the orange zest that adds just the right extra note. I’m now on my second day of nibbling these and I grow fonder of them with each bite. The dough is dry, so it’s a little challenging to roll out, but don’t be discouraged. Just keep pushing the parts that break off back into the ball and carry on. As I made them I wondered if the dough could be rolled into a cylinder and then just sliced into individual cookies? I’ll try next time and let you know. That might be in 45 minutes,the way things are going. Form dough into a round, cover with plastic wrap and refrigerate. Remove the chilled dough from the refrigerator and form into 1 inch (2.5 cm) balls. Place the balls of dough on prepared cookie sheet, spacing about 2 inches (5 cm) apart. Then, using the bottom of a glass dipped in sugar, flatten each ball of dough to about 1/4 inch thick. Might be a good solution for a drier dough that’s tough to roll. 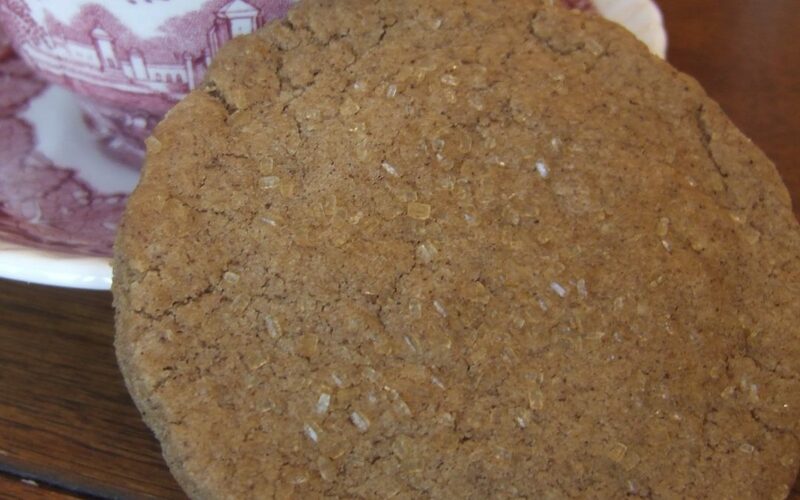 I am so glad that you baked the Speculaas and reviewed the recipe. I made a different recipe of Speculaas in a windmill mold as part of my holiday baking in December. I mangaged to learn the time-consuming technique to get the cookies to look right, but the recipe I made tasted awful. I will have to try this recipe that you found so tasty in my windmill mold. If they turn out well, I’ll share. Thanks, Kate! I, too, am obsessed with Biscoff! I discovered them when I flew on Delta years ago and subsequently embarked on a months-long odyssey to find some. I finally found them in Walgreen’s. They are one of the few “store-bought” treats I really like. If you read the ingredient list on the Biscoff box you will understand why. They use real butter, sugar and spices – no hydrogenated oils or artificial flavors. If these are just like Biscoff that’s reason enough to buy the book! Tried the chill, roll into balls, flatten with bottom of glass technique and they turned out really, really well. Just love the spices in this – the orange zest is perfect. I saw a package of Biscoff cookies at Dominick’s last night so had to get them. They are good. I would say these are an improvement although not crispy like the ones I bought last night. And you’re right Mo, the organge just makes it. 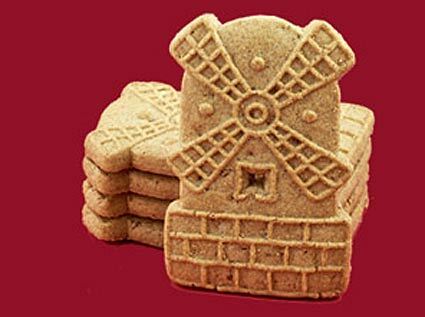 Do you know where you can purchase a cookie cutter for the Windmill cookies? I love the rectangular one with the imprint on it. Have searched for a cutter, but find none. Looks like Etsy, eBay, Amazon and King Arthur Flour all have some variation. Good luck!